It’s not a book about princesses, castles or your regular fantastical adventures. Instead, in the first book of an anticipated series, Munson Steed, CEO of Steed Media Group and the publisher of Rolling Out, depicts young black girls as doing and being anything they want—including doctors, scientists, artists and more. 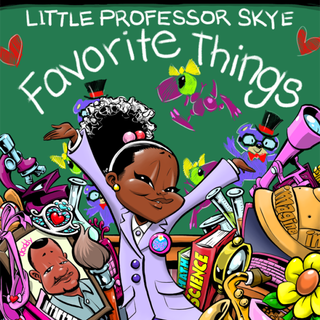 Little Professor Skye: Favorite Things details the extremely full day of a little black girl who goes about doing her favorite things, including science, math, music and athletics. The book even includes President Barack Obama and first lady Michelle Obama, to whom Skye writes a letter prompting them to later visit Skye's classroom and read to Skye and her classmates. The character in the book accomplishes a whole lot in one day, but for Steed, it was all about young girls being able to see the infinite possibilities. Steed's goddaughter, Skye, who is also the namesake of the main character, inspired the book. Skye is a rather busy girl herself, and Steed was prompted to start the book, and thus the series, when the real Skye visited him one day before going off to her piano practice. From there, Steed just went forth, with a full-fledged idea for a day filled with amazing things, all while imparting that participating in activities like the science club or going to a museum is fun and that such activities also serve a purpose. Everything Skye does in the book is fun but also has a distinct affirmation in the background. Going to the library and reading books is fun because whether you want to travel to other places or define words or find a recipe, it is all just a page turn away. Playing the piano is fun, but each day, Skye practices so that she can play beautiful music, and through practice, you can create one of your favorite songs. And that’s the crux of Steed's mission: to help young children—girls especially—to see themselves in any number of scenarios from a young age so that the possibilities can remain endless. “I just wanted it to be in a fun, learning environment with someone who can see themselves young and think of themselves in a futuristic way. For her to hold a beaker in her hand, for her to be an archaeologist, I want children to know [those possibilities] before they are headed to college, high school, junior high,” he adds. Steed also references the Black Girl Magic movement and experiences such as the young female doctor who was denied access to an ailing passenger aboard a Delta flight as other examples as to why Little Professor Skye is important. “Our girls should never be denied of their greatness,” he says. First lady Michelle Obama as well as Taraji P. Henson, who plays physicist and mathematician Katherine G. Johnson in the movie Hidden Figures, are examples of the people our girls can grow up to be, and the greatness that Sneed sees illustrated by women across the world every day. “They’re example of these women who are part of our core, part of the spirit of our community that are dynamic. They are clearly professors, doctors; they are the caretakers; they’re visionaries, inventors, and that’s the very thing that I want young girls to see in advance,” he says.